In the “little classroom” we want the children to see school as an exciting, positive experience. They participate in many “firsts” which provide the building blocks for independence, self confidence, a lifetime love of learning and respect for others. There are a maximum of eight students with two teachers. Children do not need to be toilet trained in this classroom. Depending on availability, students are enrolled in the Two-day Class (Mondays and Tuesdays), the Three-day Class (Wednesdays, Thursdays, and Fridays) or all five days. The hours for both classes are from 8:30 AM to 11:30 AM. The “big classroom” is the room to which the children in the two- and three-day classes aspire! 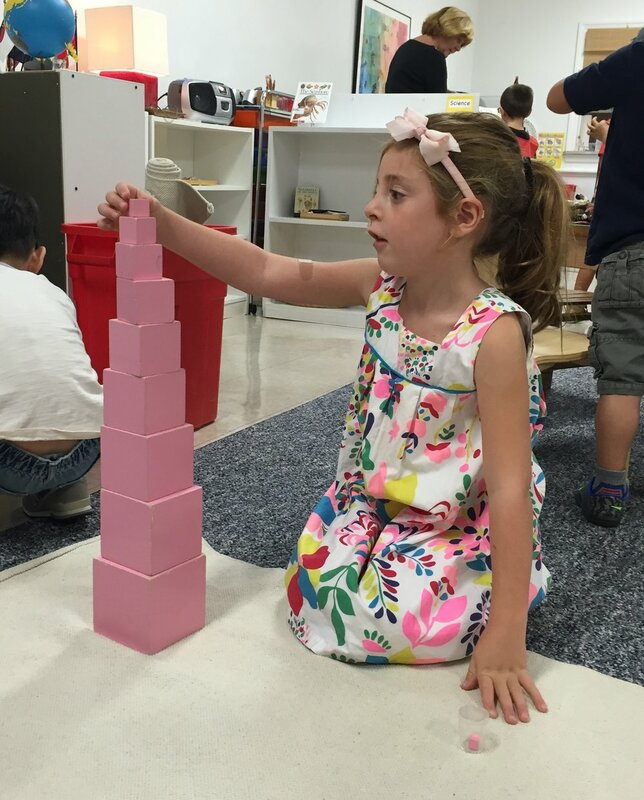 For new students, it is the start of their Madison Montessori experience. It is here, five days per week, that the children become intrepid explorers of the array of materials available to them. They embrace the lessons of courtesy, responsibility, independence and begin to develop good work habits. There are a maximum of 25 students and three teachers. Children entering this class must be toilet trained. Depending on availability, students are enrolled in either the morning or afternoon session. Need to catch the 8:01 AM train? Drop-off your child early. For this option, children bring their lunch to school and must be picked up at 12:30 when the Afternoon Session begins. Children enrolled in the Morning Session have the option to attend the elective Afternoon Enrichment Program. Children bring their lunch to school and stay until 2:30 or 3:30 PM. This program is available Monday through Friday. Children in the Afternoon Session have the option to come an hour earlier to school to attend the elective Lunch Program. Children arrive at 11:30 AM, have lunch with their friends and social play time until class begins at 12:30 PM. This lunch program is offered Monday through Friday. The Madison Montessori kindergarten year is one of amazing growth, both academically and socially. Five- and six-year-olds develop a shift in their maturation processes as they move from being ‘concrete’ learners to being able to think abstractly. This shift allows them to more deeply understand concepts in Math, Science, and Language. Montessori materials and teachers support the intellectual changes and challenges students experience during this time. For some students, kindergarten is the culmination of their years at MMS. For others, it is their first experience with us. Either way, the kindergarten year at Madison Montessori School is a very special and memorable one, for students and parents alike. Our kindergarten is academic, creative, and social and provides excellent preparation for first grade. The kindergarten program features two time options with each classs limited to eight students. Depending on availability, students are enrolled in either the 8:30 AM to 2:30 PM class or the 9:30 AM to 3:30 PM class. Tuition for the 2019 - 2020 school term (September to June): $15,300 (includes classes in Drama, Cooking and field trips as well as those classes included in the 3-6 Program - weekly Music, Yoga, Creative Movement, and Science Experiments).